HyeJin Kim drew the eyes and ears of the world by becoming the youngest performer (17 at the time) to win third place at one of the world’s top competitions, Busoni International Piano Competition, in Italy in 2005. Later, she proved her musicality and performing skills by winning an award at the Hong Kong International Piano Competition in 2008, and now she stays in Germany, studying in the Concert Performer’s Course at the Hanns Eisler School of Music. She has her final performance with the Berlin Koncert Haus Orchestra scheduled for the first half of this year before graduation and she visited Korea to spend time with her family in December of last year. I had a chance to interview her briefly and I could tell that she was a smart and ambitious performer as her profile showed and yet had the gratitude towards her parents and a warm heart and care for her friends. She went abroad during her second year at Seoul Arts High School. She thought about studying abroad when she entered high school but she could not decide easily for it was not a simple matter. However, she made a firm decision after having recommendations from teachers and experiencing music camps. She has been staying in Germany for 10 years and in fact she spent most of her 20s there. Thus, Germany is like her second home. Interestingly, however, she quickly adapts to her life in Korea when she comes home and she also focuses on studying and music when she goes to Germany, accepting the pattern and circumstances there. “I do feel lonely sometimes because I spent most of my time alone. The place I stay in Germany is so quiet that it feels empty when I do not turn on the TV or radio. But I think I have rather enjoyed that instead of thinking it is lonely or lonesome so I try to enjoy the culture such as taking recital tours, listening to music or seeing a movie often, and on a sunny day I enjoy the sky while walking around town, clearing up my mind. I try to enjoy every moment of life. The more I talked to her, I felt and became sure that she is a performer with an innately bright and positive character. Although she has been studying alone at her will rather than being forced by anyone else, she was enjoying her student life outside of home with her own knowhow. I asked her about the German education system and she explained that the educational program is great as it is designed to guide students in the direction that fits them by reflecting the character or preference of individual students rather than talking about how one does well in school above all things. She also added that students can be too independent that they need to carry the responsibility on their own, but it makes them stronger as the same time. 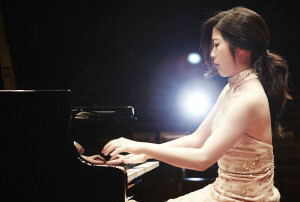 Kim won a number of prizes in various international competitions including the Netherland’s International Young Pianist Competition in 2004, Cantu International Competition in 2005, and Steinway & Sons Advanced Award Competition in 2011, and recently added another prize at the Toronto International Piano Competition to prove her skills. She played with the Gyeonggi Philharmonic at the Symphony Festival last year and was invited to the Seoul International Music Festival and Ruhr Piano Festival in Germany and held recitals along her many activities. Kim is holding her first recital in Korea in February. Although she had many recitals outside her home country, this is her first in Korea that it is a slight burden. But she is preparing for it thoroughly with music that can express her well as this is a chance to show her word of music and communicate through it. She chose Chopin for Part 1 and Schubert for Part 2. She is often asked about her favorite composer. She says it always changes rather than being fixed to a particular composer, meaning that she is open to all works of all composers. Kim usually takes a nap before she performs and tries to take as little caffeine as possible on the concert day although she loves coffee and has it frequently in ordinary times. She always thanks her parents deeply as much of her years are spent alone outside the family to study. “I am always grateful to them. I also thank them for supporting and allowing me to leave them to study, which was what I wanted at an early age. I could change my attitude and feeling toward music greatly because I was able to experience a new environment and world at an age when I knew nothing about anything. This is still the major driving force for me to consistently commit to my music. I am really thankful to my parents who always trust me and look out for me. Kim hopes that the audience feels the sincerity through her performance rather than finding music difficult to understand. She says she wants to offer the time of joy, the time to bring back memories, and time to feel the tenderness of the heart to those who come to the concert and make it an important chance to have emotional communication. While a technically excellent performance is important, Kim wishes to become a performer who can soothe people’s heart through music and touches their hearts. Kim will continue to stay in Germany as a performer after graduation and has a concert with Frankfurt Broadcast Orchestra coming up in November of this year. She will be leaving the school to become an independent performer this year and she is expected to draw great attention to her future activities.